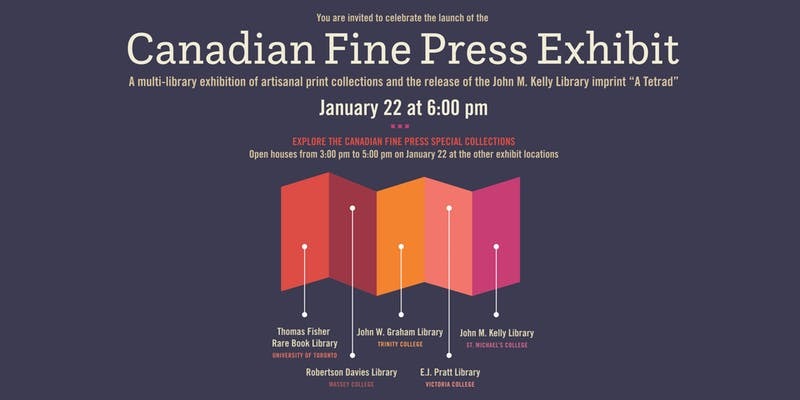 As the College Printer at the Kelly Library, at the University of St Michael’s College, UofT, I’m heading up a team finalizing preparations for the launch on Monday, January 21 of the Canadian Fine Press Exhibition. Five University libraries are participating in the exhibition, opening their doors to show their special collections of hand printed chapbooks and ephemera. 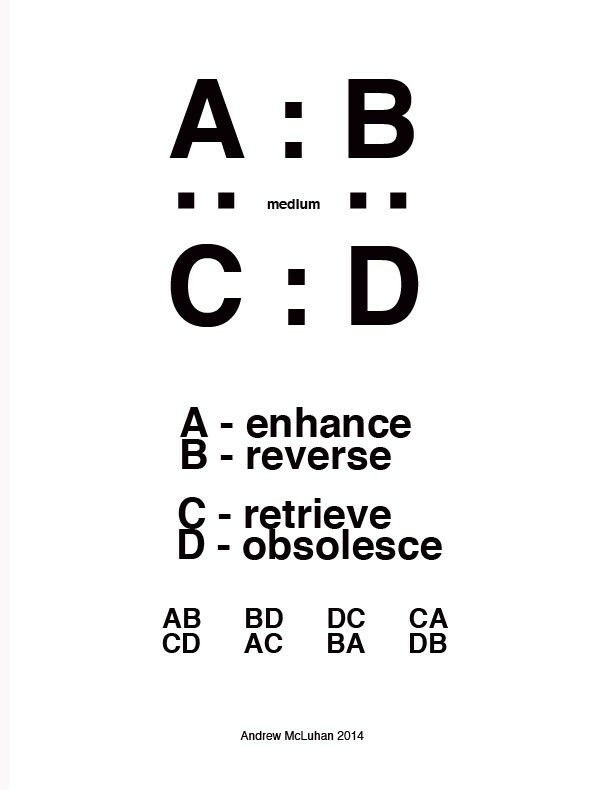 What is of particular note for the list is the release of a limited edition fine press publication being produced by the Kelly Library called A Tetrad, Measuring McLuhan’s Impact, demonstrating McLuhan’s tetrad concept. The chapbooks are letterpress printed on cotton paper and hand sewn. As a true exploration in the future of the book, this chapbook extends to an online version of the book where McLuhan enthusiasts have the opportunity to add glosses in the interactive tetrad begun there, essentially co-authoring the ongoing text with their own input. To add your own gloss to it click on the SUBMIT A GLOSS box. If accepted, your contribution will include your name and will remain online for at least a year. With exhibitions at five locations on the University of Toronto campus, the Canadian Fine Press Exhibit celebrates a wide range of letterpress publications, hand-printed ephemera, chapbooks, and other fine press works to be found within the university’s special collections and libraries. The exhibition runs concurrently from January to May 2019 and includes spotlights on poetry chapbooks, Toronto area fine presses, individual printers and designers, and the career of printer and designer Glenn Goluska (1947-2011). Discover numerous examples of artisanal publishing at its finest, as well as the stories behind the presses and printers that made these works possible. is it possible to learn of how to purchase and obtain a copy of “A Tetrad, Measuring McLuhan’s Impact” ? Sorry Gary, but I don’t know. I will try to find out, and if I do, will post the information here. “Signed by Michael McLuhan, the chapbook comes in two numbered editions: a pamphlet-stitched version of 125 copies and a Coptic-bound version in a run of 25. Costing $75 and $225 respectively, both editions are letterpress printed from plates on 100% cotton paper. Both are die cut and hand sewn. You can find out more about A Tetrad at https://kellyexhibits.ca/about-the-tetrad/. If interested parties are in Toronto, they can email me at kellylibrary.administration@utoronto.ca to arrange for pick-up and payment in person. If they wish to have a copy shipped, they can send up a cheque for the Chapbook plus shipping or pay by credit card over the phone – as above, I can be emailed for further details”.